Looks like the Boise cops and city council have taken a logic lesson from the Bush administration. When Osama Bin Laden and a bunch of Saudi terrorists hit the World Trade Center and hid in Afghanistan, Bush bombed IRAQ. In raucous downtown Boise the drunks pee in the alley, push each other through windows, shoot people and jaywalk. So the logical thing to do is move the food vendor carts?? At a public hearing Tuesday a woman who identified herself as a social scientist testified that it made little sense to blame food vendors for the misbehavior and violence in the area of 6th and Main. When she sarcastically said the rowdiness could be caused by a litany of issues, including the “rise and fall of the stock market,” Councilor Alan Shealy chastised her mention of the stock market and essentially discredited her remarks. After a long public hearing with testimony from food cart vendors, taxi drivers, and downtown business owners, the council approved a “pilot project” to move the taxis to a bus lane west of Capitol Blvd. on Main and restrict food carts to the North side of Main–across the street from the bars. The 2 a.m. drunks seeking a hot dog will make a bee line across Main for their health food treat. Fearing for the safety of pedestrians, the cops say they will have extra officers on duty to write jaywalking tickets. That’s a recipe for confrontation if ever there was one–writing tickets to drunk jaywalkers in an effort to make them safe. The GUARDIAN would like to offer its own pilot project. How about simply closing Main to vehicles on Friday nights from 10 p.m. to 3 a.m. in the congested area between Capitol and 5th. In Memphis, the famed home of blues music, the cops block off Beale Street and park a police car right in the center as sort of a beacon to those who need help or just want to chat. Meanwhile people with plastic cups full of adult beverages wander from bat to bar with no fear of a ticket or getting smacked by a Ram diesel 4WD. They even sell booze out the window like McDonalds drive through! We don’t advocate any illegal behavior, but to encourage the sale of alcohol and then crack down on all the booze driven activity seems silly. Your comments brought to mind a conversation I had with a 5th grade teacher many years ago. It seems my little daughter got into a fist fight with a little boy on the playground. When I met with the teacher I commented that perhaps more playground volunteers would be helpful. Her reply was “if we only had gun control in this country…..” I’m still scratching my head over that logic. And my mind still pictures a play yard of eleven year olds running around waving handguns. EDITOR NOTE–Did the daughter win? Boise city officals have brought this on their selfs. When you allow bars to crowd togather like they are at 6th and main they are asking for what they are getting. 6th & main has been a problem for a number of years, thanks to whomever issues the licenses for liquor resale. To really solve the problem the city needs to have those clubs more spread out. Six bars within 100 feet is not reasonable. I recall a time, many years ago when cruising was all the rage, my sister went into labor at about midnight. I rode with my elderly mother (she was driving, bless her) to St. Lukes. She had to drive right through the middle of downtown nightlife…it was an eye-opener for a nervous old lady in a 1972 Ford Ltd.
I’m like bikeboy in that I haven’t experienced the nightlife downtown for quite a long number of years. When I did, I rather enjoyed a chorizo after an evening of dark beer and dancing. Bonnie is correct that the City has brought this on itself. By years of bandaid approaches, if by no other concerted efforts. I don’t know that I agree with the concentration of bars being the issue. People who want to get drunk enough to fight can do so in a restaurant, they don’t need Humpin’ Hannah’s or Grainey’s (is there still a Grainey’s?) for that. I think bar owners failing to monitor customer alcohol sales and cut folks off, and the idea that cops can show up and break up fights, rather than infuse themselves as PART OF the nightlife and prevent fights, is a good portion of the problem. It would be a good experiment to close Main for at least that block, if not from 8th St to 5th, to auto traffic. I can just see rickshaws and horse drawn carriages, street vendors and sidewalk cafes all doing their thing. There are always going to be fights, and a few will always turn into near riots. But, placing barriers between hungry drunks who just want to eat and go home, isn’t likely the best solution. I don’t drink a whole lot now, but I sure used to. And I’m well aware that when a whole lot of diverse people are drinking, there always will be at least a few who will get fighting drunk. Wise barkeepers used to do their best to keep people eating along with drinking (free popcorn, pretzels, peanuts, etc. ), because food absorbs some of the alcohol and helps slow its absorbtion into the bloodstream. The hot dog etc. carts also help some, in that if the drunks add a little food to the mess in the stomach, it will ease the effects a little bit even then. And every minute they stand around eating the dogs is one more minute for the alcohol in the system to work its way out. The only thing worse than a fighting-mood drunk is a hungry fighting-mood drunk. So, move the food farther away? And then give him a ticket for jaywalking just to really piss him off? How do you give a jaywalking ticket, anyway. To whom do you make it out? : Just ask the drunk his name, and expect him to tell you the truth … if he can even remember his name? Pedestrians don’t have to carry driver’s licenses, you know. And what’s the penalty if he doesn’t pay the ticket? Revoke his shoes? Or do we want to wind up the year with a few hundred more bodies crammed into our jails for trying to get a hot dog? I can’t imagine what the cops were ingesting that let them think moving the food and rides farther away would improve the situation rather than make it worse. Have you ever been to Sixth Street in Austin, or New Orleans, or the River Walk in San Antonio? “Six bars within 100 feet is not reasonable,” writes Bonnie. Get real. Another case of over-reaction. Boise is long overdue for more pedestrian only areas, especially in Downtown and Hyde Park. I don’t see this a coddling drunks and rowdies, but simply getting over our arranged marriage to the almighty automobile. “Streets for People”, anyone remember that event? I’m guessing though, that Memphis and other areas that do have larger pedestrian only areas also have some kind of public transit that takes the place of the single driver car. Having taxi cabs as the only way out for people drinking and dining downtown seems like a traffic jam waiting to happen. (I’ve never understood why folks would want to eat or drink at a sidewalk cafe that is a foot from a car exhaust tailpipe myself, but that’s me). I think no car zones and more transit options would make Boise a more enjoyable and less hectic place to live. Nice photo there Guardian. I imagine that the City would be happy to create pedestrian only zones if they could figure out how to charge for walking around. You don’t have to mention the stock market for the self pronounced “mind” of the council to demean you in public or discredit you or your neighborhood. And don’t you dare read from the city code and call attention to very simple words like “must” or “shall” or “transition” or “height” or “hardship”. Only he knows the real meaning. Happens virtually every week to anyone that appears more learned than he – which is almost everyone. I have a close relative who got at least one “walking while under the influence” ticket, who did not have a driver’s license because he did not drive, but probably was drunk. I can’t imagine how he was a threat to the general public and my respect for law enforcement was seriously challenged by that action. I also agree that moving food and taxis away from the people who most need them is a really dumb idea. Ah, Mr.Mayor and Councilors, how could you go so wrong? Since the police can’t seem to stop the wild ride we have to go through driving down State St and all the the people running red lights. 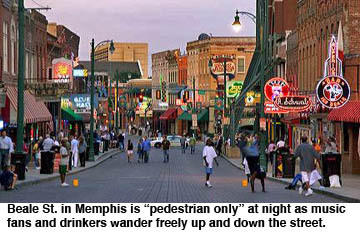 How do you expect them to control Main St drunks. Geeee don’t we expect a lot out of our Law Inforcers. Well Bert Farber you have your opinion and I have mine. I`m not concerned with what is ok in other cities, and I`m sure they also have problems. In case you missed it the topic happens to be about BOISE..
Bonnie…puh-leez, I did’t miss the fact the topic is about Boise. I was trying to suggest that Boise can learn from OTHER cities who have had to deal with a booming night life. Course, it used to be downtown Boise was dead as a doornail at night. One solution might be to outlaw fun and drinking in Boise. Bars can sell hot dogs. Street vendors can’t sell boos. Where’s the justice in that??? Alcohol is fun. One of the great things about living in Boise is the easy access to boos downtown. Justice and quality of life: Hot dogs and boos. Several blocks (say from 12th to 4th, or thereabouts) of Idaho and Main should be permanently pedestrian only. It’s been about 25 years since I was in Helena, Montana, and I seem to remember their main drag was pedestrian only, and it was nice. Those hot dog guys could set up pretty much anywhere then. The Guardian comparing the local authorities to the Bush Administration is apt. A real insult, but appropriate, and funny. Wife and I went down town last night to have a nice dinner. When we came out to head home about 10 PM. What a Zoo! Squeeling tire’s at the stop lights, cars cutting in and out of traffic. Guess what! Not a cop in sight. Hey! Boise Police! Where the hell are you? Okay, so what does it take to get the City to implement the best suggestion I’ve seen so far as proposed by the Guardian in his original piece? Seems like it deserves a try too. I used to live in Orlando,Florida. One of the popular streets was Church Street lined with clubs and bars. OPD was smart and would close the street at 7:00 pm so people walking out would not get hit or have issues with traffic. Boise,take a hint and do the same. Stop trying to issue Jaywalking tickets to people who you know are going to be drunk or buzzed from alcohol. Is the city that hard up for money? Closing a portion of the streets to only pedestrians at night is an excellent idea. I have personally seen this in many cities such as Orlando, Savannah, Tampa Bay, and many others. It works. It is not only more fun, but safer and much easier for the police to monitor. We should not try to hinder the night life downtown because if it wasn’t for the vibrant night life downtown would still be suffering. We should encourage and nurture it and work to make it more enjoyable and safe at the same time. Another point I wanted to mention. I personally partake in the activities downtown on a regular basis and I have witnessed a serious problem. The behavior of several individual BPD officers who volunteer for the weekend duty is pathetic. While I have the utmost respect for law enforcement as a whole, there is no excuse for some of these individuals behavior. Some of them seem to cause more problems than they solve. I have literally seen them pick fights with people, indiscrimanently mace crowds of innocent bystanders, chase young girls down to ask for their number(while on duty), Verbally assault and threaten people with physical violence in an attempt to provoke them, and many other things. These are just a few things that come to mind although there are many other examples. They need to be trained on how to act in a professional manner and how to handle situations they encounter.